I am not teaching high school to my children yet, but I have taught high school in public school! I taught Agriculture Education. 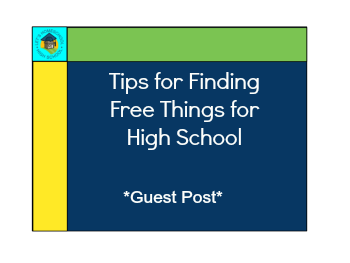 When I was student teaching, I found loads and loads of FREE things on the Internet to teach my classes as well as complete my “Lesson Plans” for my other teaching courses while in college! Check with your state guidelines for High School Curriculum required to graduate as well as to attend college. These may vary by state! Decide whether your child is going to attend college and choose the classes he/she will take to make sure he/she will get accepted to college. Allow children to find an internship or job whether for pay or volunteering in the field which he/she is interested. On the job training is some of the best training. This job may cost you some gas money, but it will be valuable in the long run! Experience is well looked upon by colleges sometimes even more so than grades! I had all scholarships throughout college. Much of it was from my grades, however, I also received some scholarship money for my experience! I was an Agriculture Education Major. I worked on farms, in greenhouses, raked yards, worked in Agriculture Retail, compiled my Dad’s farm taxes, and more! I actually had a professor who said they accepted someone to UT College of Veterinary Medicine with a 3.4 GPA over a 4.0 student because the 4.0 student had NO experience! He had majored in biology through the Main Campus and had really never touched an animal! He had only seen pictures and looked in microscopes! The 3.4 student lived and worked on a farm and volunteered at a vet clinic! He was a hard worker, but not necessarily the best student where grades were concerned! Personal Note: My goal is to get the majority of book work learned by the time my children finish 8th grade, so I can spend time teaching them or helping them with what they feel God has called them to do in life! In reality the majority of the ‘”new” things I learned in high school were in my AG classes! Yes, I took the AP classes and went through calculus, but I did not need it for my major, and I really have not used it since! All the garbage (humanistic books) I read in English class, I have never used. I did learn a little more about writing papers, but I found when I was in college, each professor wanted me to write my papers differently! When my husband went to college at age 30, he had NEVER written a paper in his life! He was homeschooled and his mom did not require it! Anyway, I proofread his first one and helped him a very little, but he made a 100 on it and all the rest! He took 9 credit hours (3 classes, 1 per semester) for a Project Management Certification and made straight 100s on his papers and tests! He had never taken any tests either! Ask other homeschoolers if you can borrow books or purchase them cheaply. Look for used books on Craigslist, eBay, Freecycle, or at a used book store or used Homeschool Book Sale. McKay’s Used Books and CDs in TN has a FREE box. I have found many textbooks in it! Many of them are even Christian instead of secular! Also, in TN, Cedar Springs Christian Store and Lifeway Christian Stores have great used Homeschool Curriculum for very cheap! Create your own curriculum using the Internet, Library, and what books you do have! Yes, you can do it! I had to help create the High School Horticulture Curriculum for the State of TN when I was in college as a “Special Project.” I had to include ALL resources I could find in a bibliography for the TN teachers! It was an extensive list! I used magazines, books, internet, and anything else I could find! I have continued to develop my own curriculum for my children at home geared toward each learning style. I hope I can continue with my method throughout high school! If you cannot find an internship, give your child projects to do which will help with the career he/she wants to pursue! Look for other classes… for instance, if your child wants to be a Paramedic/Nurse/Doctor, take a Red Cross class! If your child wants to be an artist, find an art class! If your child wants to Major in Music make sure he/she is enrolled in personal music classes as well as getting experience with the Symphony or some other group depending on the instrument. Trade something you can do with something other parents know how to do. For instance, my husband had friends who were chemists (as well as two grandparents). These friends taught several homeschoolers Chemistry. There were other parents who knew other things and shared their knowledge. When we were in TN, my children were learning Spanish from a good friend who was also a homeschool mom and fluent in Spanish, French, and English! Similarly to trading out what you know, you can also enroll your child in a homeschool Co-Op (more on those next week). Most co-ops meet once per week and teach classes such as Chemistry, Biology, Math, Music, Dance, Art, etc. which many parents cannot teach themselves. My husband’s mom began one of the first Co-Ops in Knoxville, TN well over 20 years ago! She helped with the choir and band! Make sure you know ahead of time the requirements for college or a diploma so you do not get to the end and realize your child is several hours and classes short of actually graduating when anticipated! (View college planning tools for homeschoolers) This happens in public school all the time! It is important to reassess each year! Also, I know when I was in high school, they even changed the credit hour and class requirement my junior year since they introduced block scheduling! Make sure you keep up with any changes made in legislation or curriculum requirements! The Frugally Farming Family are a second generation homeschooling, homebirthing, homesteading, Christian family of 9 with baby number eight due in August. We raise dairy goats, beef cattle, chickens, and guinea hens as well as organic vegetables and fruit.